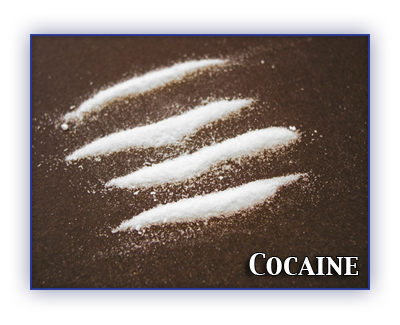 Cocaine is a powerful drug made from the South American coca bush. Its street names include coke, C, snow, and flake. Cocaine is sold as a fine white powder. Street dealers sometimes dilute it with substances like cornstarch or sugar, or local painkillers like benzocaine. Users often snort cocaine. They also dissolve it in water and inject it into their veins. Crack is cocaine chemically changed so it can be smoked. Crack chunks are also known as “rock.” Freebase is a pure form of cocaine that can also be smoked. Some crack and freebase users inhale the vapors from heated glass pipes. Others add them to tobacco or marijuana cigarettes. All forms of cocaine have the same effects. But injecting produces these effects more quickly and intensely than snorting. Smoking it causes the most intense and addictive high. Possessing, producing and trafficking in cocaine can result in fines, prison sentences and a criminal record. Cocaine use is linked with suicides, murder and fatal accidents. A cocaine high can last from 5 minutes to 2 hours. When users “crash,” they feel very depressed, anxious and irritable. Many users take repeated doses to maintain the high and avoid the crash. Some users try to modify the effects or stop binges with drugs like alcohol, tranquilizers or heroin. What are the effects of long-term use? Heavy cocaine users can feel depressed, restless, agitated and nervous. They can have sleeping, eating and sexual problems. They can have dramatic mood swings, delusions, hallucinations and paranoia. High blood pressure and irregular heartbeats occur. Repeated use may cause long-lasting problems with memory, attention and behavior. Chronic snorting causes stuffed, runny, chapped or bleeding noses, and holes in the barrier separating the nostrils. Those who inject cocaine risk infections including hepatitis and HIV, the virus that causes AIDS. Freebase and crack smokers report severe throat and lung irritations. They may cough up black phlegm or blood. Using cocaine during pregnancy can cause miscarriage or premature birth. The baby may have a small head, low birth weight, blocked blood vessels in the brain, and other physical problems. It can be irritable, with sleep and feeding problems. Infants breast fed by mothers using cocaine can suffer seizures and extreme irritability. People who use cocaine heavily over a long period of time, or binge for several days, develop tolerance. They need to take more cocaine to feel the same effects. Regular users can develop powerful psychological dependence, a constant craving for the drug. They continue to use the drug even when it causes overwhelming physical, mental and social problems. When dependent users stop using cocaine, they go through withdrawal. Symptoms include sleeping and eating disorders, depression, anxiety, irritability and strong cravings to use again.